A trip to Vietnam is not complete without tasting the street food. With emigration and globalization, many Vietnamese street food dishes have become popular favorites around the world. The iconic Vietnamese Beef Noodles or Pho Bo is perhaps one of the best-known dishes and the Vietnamese spring rolls wrapped in rice paper, or Cha Gio is another dish that is closely associated with the country. With Vietnamese ingredients now easily accessible in Chinatowns and supermarkets worldwide, you can prepare these delicious Vietnamese street food recipes in the comfort of your kitchen. Start your food tour of Vietnam with this Cha Gio recipe. 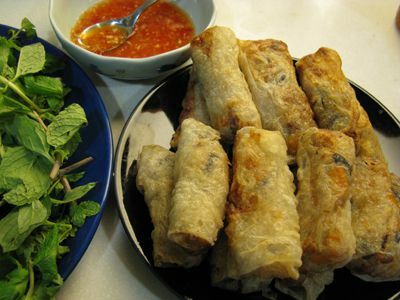 These traditional Vietnamese spring rolls were originally made for royalty and featured a spring roll within a spring roll. Bursting with fresh veggies and herbs, it is strong on taste as well as nutrients. These chicken wings are good candidates for the barbecue but they can also be roasted in an oven or grilled. While chicken wings may be a traditional barbecue food, these Vietnamese chicken wings are marinated to give a distinctly Southeast Asian twist to the flavor. This popular Vietnamese dipping sauce is a combination of coconut juice, fish sauce, lime juice, rice vinegar, chilies, and garlic. It goes well with most dishes on the Vietnamese menu and adds layers of taste to both the Cha Gio and grilled chicken wings. Believed by some to have been a legacy of the French beef stew or pot au feu, the Vietnamese Pho Bo is one of Vietnam’s best-loved dishes. Slices of raw beef together with raw bean sprouts, mint and basil leaves are served with noodles in boiling hot soup and get cooked even as they are being eaten.